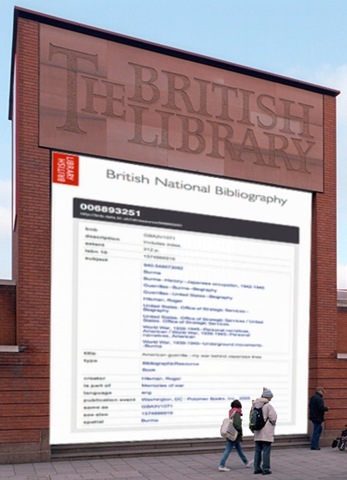 Today the British Library announced a significant contribution to the development, application, and sharing of bibliographic data using Linked Data techniques and technologies, with a preview of a new approach to publishing the British National Bibliography. Chief Executive Dame Lynne Brindley announced the initiative in her Keynote at Linked Data and Libraries 2011, hosted by Talis at the British Library (BL) in London. 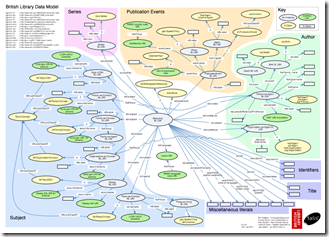 The Metadata Services Team at BL have been working with Tim Hodson, and other Talis consultants, over the last few months to apply Linked Data modelling practices to bibliographic resources. The British National Bibliography (BNB) of 2.8 million titles was used as the basis for this work. This differs from their first bibliographic publishing initiative using RDF in that they did not set out solely to encode their collection of Marc records into RDF/XML, as they and several other libraries have done previously. Instead, building on training and workshops with the Talis team, they set out to model ‘things of interest’, such as people, places and events, related to a book you might hold in your hand. Although they were constantly aware of the value of the BNB data, they did not want to be constrained by the format and practices that went into it’s creation over many years. Following Linked Data practices adopted across the web by governments, business and academia, they modelled these ‘interesting things’, reusing as many existing descriptive schema as possible. They were keen to reuse the likes of foaf, dc-terms and skos. However there were some areas for which there was no suitable existing property with the right meaning. 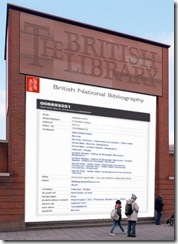 To fill this gap, a set of British Library Terms (BLT) was developed and will be published alongside the data. As you can see from the model (click for a larger view) also published today, they have gone a long way down that road. As all involved agree, this is the beginning of a journey and there is much more to do. To support the model, the BL has released a subset of data (books published or distributed in the UK since 2005) published under an open CC0 license, hosted in the Talis Platform, giving access to a SPARQL Service, a Search Service, and a Describe Service. Through Linked Data Views, data for resources are available in both html and several rdf formats (rdf/xml, turtle, json) for programmatic access. The intention is to build to a full representation of the BNB, including serial publications, multi-part works and future publications, as data becomes available. The follow-your-nose linking effect associated with Linked Data is very apparent when clicking through from example resources (eg. http://bnb.data.bl.uk/id/resource/006893251). For instance, note the path you follow when clicking on the publication event, bringing together time, place and agent as individual resources. Try following the links through to creator, the BL resource being identified as being the same as the viaf identity 37001878. To paraphrase Neil Wilson, who leads the BL Metadata Services Team, this preview represents a work in progress that is hopefully sufficiently developed to be of interest across the wider web of data for audiences wanting to interact with bibliographic data. It also represents a significant contribution to a conversation underway in the library world seeking to publish our valuable resources in a useful and easily consumed way. We hope others will join the conversation. Neil, and Talis’ Rob Styles are also presenting at Linked Data and Libraries, explaining the journey of the project and the philosophy and approach to building the model. Check out the event site where their presentations will be made available.